Computer and information technology is a fast-paced, lucrative, and promising field. Those entering the field can expect higher-than-average returns on their educational investment (several six-figure occupations require only bachelor's degrees), but also nearly unlimited potential. According to the U.S. Bureau of Labor Statistics, today's ever-growing demand for cloud computing, information security, and big data will accelerate the industry's growth by 13% through 2026. Management information systems (MIS) bridges the gap between people, technology, and organizations; a necessary service within just about every business. An online bachelor's in management information systems prepares you to use information in ways that improve a company's operations and ensure their success. Unlike computer science or information technology, MIS focuses on people and technology services. This career helps businesses manage their information systems, while also educating employees on how to best understand and navigate them. Therefore, online bachelor's in management information systems curriculums are three-pronged: they combine business processes, information technology, and human behavior. Students in these programs explore the networks, software, and hardware of information systems, and ways to collect, process, organize, and synthesize data. Coursework may include subjects such as website and database design, financial information systems, telecommunications, project management, and even sociology. Some programs also offer unique concentrations, including knowledge management and health informatics, to tailor your degree to specific career interests. To further differentiate programs, pay attention to resource offerings. Does the school equip their computer labs with the latest technology, employ faculty with industry connections, and develop local internship programs? Your career will demand the practical application of computer knowledge, so hands-on experience is a critical part of any online MIS degree. East Carolina University ranks #1 on The 15 Best Online Bachelor's in Management Information Systems Programs! East Carolina University offers students an opportunity to earn an online bachelor's in management information systems through its distance education department. The bachelor of science in business administration provides a concentration in management information systems with a 120-hour degree plan. The curriculum includes 36 hours of instruction in general business courses, such as accounting, finance, and strategic management, while the concentration provides an in-depth study of database management, software design, and information systems. A cooperative education course allows students to supplement their education with hands-on work. ECU also requires students complete a nine-hour sequence in professional development and leadership, which includes a leadership capstone course that brings their undergraduate experience together in a hands-on project. Students also complete a portfolio that showcases projects and expertise for students' use when seeking employment. Located in Greenville, North Carolina, ECU's online programs provide a degree path for students who have completed general education requirements through a two-year or four-year college. The North Carolina Articulation Agreement ensures students transferring from other accredited North Carolina schools receive credit for their prior coursework. The school also accepts transfer credits from regionally accredited institutions. The Office of Continuing Studies works with students to design degree plans that allow students the flexibility necessary to complete studies while honoring their work and family commitments. The Blackboard online learning platform provides course access 24 hours per day. An orientation program familiarizes students with the platform and available resources, such as the bookstore and online student forums. ECU holds specialized accreditation from The Association to Advance Collegiate Schools of Business for its bachelor's of business administration, master's of business administration, and master's in accounting. Keiser University - Ft Lauderdale ranks #2 on The 15 Best Online Bachelor's in Management Information Systems Programs! Keiser University teaches students business and technology skills in its online bachelor's in management information systems program, ensuring graduates can use technology to drive business success. The bachelor's in MIS requires 126 credits, all of which can be completed remotely through Keiser's online learning program. The curriculum includes courses in accounting, financial management, marketing, and human resources, with 65 credits dedicated to management information systems and computer programming skills. Students also complete hands-on learning assignments with community organizations. Students enjoy an accelerated class format that allows them to complete one class every four weeks. The Blackboard online learning platform provides around-the-clock access to course materials, offering students flexibility in achieving their academic goals, while small classes help students connect and build strong relationships. A nonprofit, Keiser University, in Fort Lauderdale, Florida, offers more than 100 degrees, all focused on career preparation. Advisory boards made up of experts in each field help design the curriculum to ensure its relevance and prepares graduates for their chosen career field. The university accepts transfer credit from regionally accredited schools and offers credit for military training and life experience, provided the experience is related to course objectives. Online students enjoy access to the school's Department of Student Services, which can assist students with career searches and professional development with access to the online career center. Honor societies and student government associations extend membership to online students, as well. An online bookstore and library access give online students the educational materials necessary for success. Keiser University is regionally accredited by the Southern Association of Colleges and Schools Commission on Colleges (SACS). 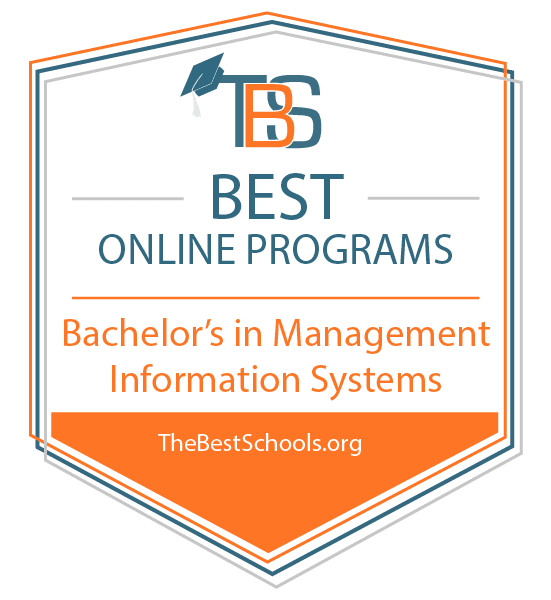 Dallas Baptist University ranks #3 on The 15 Best Online Bachelor's in Management Information Systems Programs! Dallas Baptist University's professional studies program allows working students to complete a management information systems bachelor's degree online. Students complete courses in software development, networking, system analysis, and database design. The security and forensics course ensures students are up to date with the latest cybersecurity information and can develop appropriate protocols and procedures to protect computer systems and data. As a private Baptist college, the university provides instruction with Bible-centered values and ethics. A capstone course, Strategic IT Planning and Project Management, allows students to showcase their technical expertise, leadership skills, and problem-solving abilities. The degree requires 120 credits, and students can complete all classes online. DBU serves more than 1,800 students through its 59 online programs and boasts a 92% student completion rate. Online education isn't for everyone. DBU requires prospective online students to take a self-assessment and meet with an academic advisor. Faculty members use web conferencing, media on demand, and mobile web platforms as part of the course delivery. Course discussions allow students to interact while demonstrating their understanding of the material. Students have access to technical support 24 hours per day. Asynchronous courses allow students to complete coursework when it best fits into their schedule. Course length varies from 16 weeks to accelerated five-week classes. Online students enjoy full access to resources from the Vance Memorial Library, including online databases. Library staff will mail selected books to distance education students. DBU's writing center also serves online students through its interactive web interface. Colorado State University - Global Campus ranks #4 on The 15 Best Online Bachelor's in Management Information Systems Programs! Aspiring management information systems professionals can earn their online MIS bachelor's degree through Colorado State University-Global Campus. The curriculum prepares students to work in roles, such as chief information officer or director of information systems with their foundation in business and technology. Students may also choose from more than 20 areas of specialization, such as healthcare management and cybersecurity. Awards of Completion and Skills Endorsement in strategic management and business analytics for management and decision making provide additional skill certification to build resumes. The 120-credit program includes a capstone course and practicum, giving students an opportunity to showcase their comprehensive skills. Colorado State University-Global Campus founded the fully online global campus in 2007, establishing the school as an independent institution. An accelerated class format allows students to complete classes every eight weeks, with starting dates throughout the year and every course offered each semester. Asynchronous classes ensure students can meet their family and career obligations. CSU-Global is the first fully online nonprofit university in the nation, ensuring students receive a robust and relevant education and earn a degree that will be recognized by employers and other institutions. CSU-Global does not charge online students out-of-state fees or tuition. Rates remain the same when students begin their degree plan. The school accepts transfer credits from accredited institutions and college credit for military training, industry certifications, and prior learning. Information technology certifications can replace some of the required information technology specialization requirements. Washington State University ranks #5 on The 15 Best Online Bachelor's in Management Information Systems Programs! Washington State University allows prospective management information systems students to complete an MIS bachelor's degree through its fully online global campus program. Students with an associates degree and entry-level business courses may apply for certification as a business major. The upper-level degree plan includes 60 credits in business and management information systems. The college of business requires all students complete an international experience, which may include studying abroad or completing a minor in a foreign language. More than 600 study abroad programs in more than 70 countries provide ample international study opportunities. Students enjoy accelerated class formats for business courses, though general education courses follow the traditional 16-week semester schedule. WSU maintains regional institutional accreditation and specialized accreditation through the Association to Advance Collegiate Schools of Business. Faculty members have access to the latest innovations in distance education through The Spark digital classroom building, including media development lab, faculty innovation studio, and ongoing professional development and technology support. The Blackboard online learning platform provides asynchronous classes that utilize a variety of multimedia resources. Online students receive support from academic advisors, tech support, online tutoring services, and a writing lab. Also, online students participate in a student government association dedicated to the unique needs and challenges of distance learners. Students may access resources through the WSU libraries, which includes online databases, e-books, and digital collections. Colorado Christian University ranks #6 on The 15 Best Online Bachelor's in Management Information Systems Programs! Colorado Christian University's online bachelor's degree management information systems program offers a technical foundation graduates can utilize in business environments of all sizes. Students may take all courses online or attend in-person classes at the Lakewood, Colorado, campus. The curriculum includes 120 credits, including system design and architecture, information security, and software development, along with a liberal arts general education core. While students develop business acumen and technical abilities, the school also emphasizes ethics and social justice with a biblical worldview. A comprehensive capstone course allows students to demonstrate their technical skills and project management capabilities. Students can finish major course requirements in as little as four semesters. Colorado Christian utilizes a cohort system, allowing students to form strong connections as they move through the program requirements. The online platform delivers classes asynchronously with an accelerated format. Students may access the Blackboard virtual classroom from their laptops or mobile device. Courses take five to ten weeks to complete, with new courses beginning every five to seven weeks. Students may transfer up to 90 college credits from accredited institutions, and CCU offers up to 75 college credits for prior learning and life experiences. Founded in 1914 as Denver Bible College, Colorado Christian serves more than 5,500 students through its College of Adult and Graduate Studies. A Student Achievement Award provides reduced tuition for full-time students if they maintain satisfactory academic progress toward their degree. Colorado Christian University is regionally accredited by the the Higher Learning Commission (HLC). Ottawa University ranks #7 on The 15 Best Online Bachelor's in Management Information Systems Programs! Ottawa University understands the increasing reliance of businesses in technology and offers an online bachelor's in management information systems to help busy students reach their educational and professional goals. The 124-credit program includes foundational technology courses that prepare students to work with the latest technical innovations in hardware design and software programming. Students can choose further specialization through a 20-credit minor or a 12-credit concentration. Ottawa University offers degree concentrations in economics, finance, leadership and management, and marketing. The capstone course, Methodologies of Project Development, allows students to develop, test, and implement a software solution to meet a real-world business need. The bachelor of arts program moved under the leadership of the university's school of business in the 2017-2018 school year, allowing for greater collaboration and integration of business practices with technical skills. Online students not only have flexible access to their courses through the Blackboard learning platform, but also work closely with academic advisors to complete their course requirements as quickly as possible. Students can apply up to 80 hours of previously earned college credits toward their degree, including credit for work experience or military training. Courses take eight weeks to complete, with most requiring weekly assignments, such as online discussions, presentations, or research projects. Ottawa University, based in Ottawa, Kansas, maintains two residential campuses with eight adult campus locations in three states, along with fully online degree options. Founded in 1865, it began as a boarding school for children of the Ottawa Indian Tribe as a partnership between the tribe and Baptist missionaries. As such, certified members of the tribe may attend the school tuition-free. The school serves more than 5,000 students each year through its on-campus and online programs. Minot State University ranks #8 on The 15 Best Online Bachelor's in Management Information Systems Programs! Minot State University, in Minot, North Dakota, offers a fully online MIS bachelor's degree for students seeking to advance their careers in the areas of business and management information systems. The four-year, 120-credit program, offers a systems analyst track or an information technology manager track, depending on career interest. All students complete a core curriculum in business education, such as fundamentals of management, corporate finance, and accounting. The specialized information systems courses not only cover web design, information technology infrastructure, and computer programming, but also courses in collaborative computing and outsourcing management. The school allows for even greater specialization, with concentrations in information processing and marketing education. Students can seek out internship opportunities on a semester or project basis. The final capstone course brings all areas of learning together for a final hands-on project. Most classes use an asynchronous instruction model, allowing students flexibility to complete assignments, but some do require scheduled meeting times. The Blackboard online learning system allows instructors to incorporate a variety of media into their lesson plans, including videos, audio samples, and reading selections. Classes vary from traditional 16-week courses to accelerated eight-week formats. Minot State offers ten undergraduate degrees entirely online. A generous transfer policy allows students with prior college experience to apply those credits toward their degree. MSU has provided online learning opportunities for 18 years. Support services include on-demand online tutoring, access to library resources, and an online writing center. Minot State University is regionally accredited by the Higher Learning Commission (HLC). Columbia College ranks #9 on The 15 Best Online Bachelor's in Management Information Systems Programs! Students gain relevant, hands-on technical skills through Columbia College's online bachelor's in management information systems. The curriculum combines in-depth computer information system courses with core business and management classes. A variety of electives from across the school's business, computer, and mathematical sciences departments allow students to complete a degree that aligns with their interests and career goals. Students can delve into programming languages such as Python and Java, while also ensuring they manage business relationships and align technology needs with strategic business goals. Eight-week terms offer students six chances to start work on their degree each year. The accelerated format allows students to complete requirements more quickly and focus on one or two classes each term. Students can complete the 124-credit bachelor's degree program in as little as three years and five months. Columbia College provides online students with dedicated support from their academic advisors. Online students may also utilize the school's career services, including help with finding relevant internships, evaluating and improving résumés, and mock interviews. Originally established in 1851 as a Christian women's college affiliated with the Disciples of Christ Church, the private, nonprofit liberal arts college transitioned to a four-year, coeducational institution in 1970. Though it remains affiliated with the Christian Church, the nonsectarian school welcomes students of all faiths. Columbia College operates 35 locations in 13 states in addition to its online offerings. Students may transfer up to 90 credits to Columbia College. The school accepts up to 60 college credits from accredited institutions and offers non-college credit for military and professional training or credits earned by examination. Bellevue University ranks #10 on The 15 Best Online Bachelor's in Management Information Systems Programs! Bellevue University designed its online bachelor's degree management information systems program with working information technology professionals in mind. Admission to the accelerated degree completion program requires at least three years of experience working in a technology-related field and the completion of an associate's degree. Students enter the program as part of a cohort, moving through 49 required credits together over 72 weeks. Students need only register one time for their classes, developing a degree plan with their academic advisor. Major coursework includes business communication, strategic management, finance in information technology, information security management, and project management. Bellevue University also requires students to complete its nine-hour Kirkpatrick Signature Series, which focuses on the political and philosophical traditions of the United States and American democracy. All classes meet online, though students have the option of attending some classes in person. All online courses offer flexible formats that fit around work and family responsibilities. The cohort model ensures students can take classes when they need them, while students develop strong relationships with fellow learners. The school offers a generous transfer policy, with 88% of students successfully transferring college credit, with articulation agreements in place with more than 150 colleges. Credit transfer can help students satisfy the 18-credits of electives required for the 127-credit program. The school also developed a free online course to help students understand how to make the most of prior training and accomplishments to produce a portfolio for possible college credit. Bellevue University, in Bellevue, Nebraska, also offers a master's in management information systems, which has earned specialized accreditation from the Global Accreditation Center for Project Management Education. Viterbo University ranks among The 15 Best Online Bachelor's in Management Information Systems Programs! Viterbo University in La Crosse, Wisconsin, integrates information management and business courses to offers an online bachelor's in MIS. The flexible online format and accelerated class schedule make the degree ideal for those with an associate's degree and experience in information technology. Project management and business information comprise the core curriculum of the degree plan, which includes ethical leadership, managerial finance, and systems analysis. Students who have earned an associate's degree need only complete an additional 60 credits. Many students complete their degrees in as little as two years, dedicating 15 to 20 hours each week to their classes. College classes completed at accredited institutions transfer provided students made at least a C in the class. Discussions and group projects allow students to showcase their knowledge and abilities in the online classroom format. Courses follow an accelerated seven-week format, and students enjoy access to academic advising, online tutoring sessions, library services, and technical assistance. Viterbo, a Catholic university, does require students complete three credits in theology and faith and practice. The school offers college credit for prior learning, such as industry certifications or military training. The MIS program works best for those with experience in the field and at least some college credit, but school admission does not require students have an associates degree. Students taking more than six credit hours a semester may apply for financial aid. Viterbo University is regionally accredited by the Northwest Commission on Colleges and Universities (NWCCU). Amridge University ranks among The 15 Best Online Bachelor's in Management Information Systems Programs! Amridge University prepares graduates to enter the growing field of information systems management with its online MIS bachelor's degree. The 128-credit undergraduate degree includes 60 hours of specialized instruction in business fundamentals and emerging technology. Information management instruction includes data security, web design, open source business systems, and networking. Students gain hands-on experience in project management and learn how to deploy new technology solutions in a business environment with training and employee development. Students complete a portfolio that highlights their projects and accomplishments. The information systems management program offers an opportunity for students with some college experience to earn their undergraduate degree, advancing their career opportunities. Online classes utilize collaborative learning and team projects to develop leadership abilities, all while providing flexibility to students balancing school and work or family obligations. Amridge University boasts a 92% rate of graduates employed in 2016, with 88% of graduates working in their career field. The school helped pioneer distance education delivery as part of a 1993 pilot program of the U.S. Department of Education. The results of the program helped lead to changes in federal law and expanded distance education opportunities for students around the country. While Amridge University maintains a physical campus in Montgomery, Alabama, most courses utilize distance learning technology. Most classes feature asynchronous scheduling, though some general education courses require students to log in at scheduled times to participate. Classes may be seven to 14 weeks in length. Founded in 1967, the private school maintains its affiliation with the Churches of Christ denomination. University of Houston Downtown ranks among The 15 Best Online Bachelor's in Management Information Systems Programs! The University of Houston-Downtown modeled the online bachelor's in management information systems curriculum on the recommendations of national industry organizations and professionals in the field. Courses allow students to gain expertise in information system areas such as project management, infrastructure development, web technologies, and more. Students study programming languages and the latest developments in information security. Electives allow students to specialize in emerging technologies and business trends, such as e-commerce and enterprise systems. The online program offers students the flexibility to complete their degree while accommodating work and family responsibilities. The online schedule uses a two-year rotation for required and elective courses. Students access quizzes and exams through the Blackboard learning platform and take part in online discussions and collaborative projects. Students may also opt to take some classes in person at the Houston campus or one of the three satellite locations. More than 44% of UHD students take advantage of online or hybrid class offerings. Online students enjoy access to all on-campus services, including library resources. Students may access online databases, ebooks, and videos, and may have other materials sent by mail or through a Texas library TexShare program. UHD's bachelor of business administration in management information systems has earned accreditation from the Association to Advance Collegiate Schools of Business. Transfer credit from accredited schools allows students to accelerate their degree completion through articulation agreements and established degree plans in place with Texas community colleges. The University of Houston is regionally accredited by the Southern Association of Colleges and Schools Commission on Colleges (SACS). National Louis University ranks among The 15 Best Online Bachelor's in Management Information Systems Programs! Leadership and strategic management make up the core of National Louis University's management information systems bachelor's degree online program. The university designed the curriculum specifically for information technology professionals looking to move into management positions. The curriculum explores trends in information technology and how businesses, government agencies, and non-profit organizations utilize technology to achieve strategic goals. Courses in human resource recruitment, project management, and business communication ensure graduates possess the skills necessary to step into management roles in their organization. The degree requires 180 quarter hours, including general education classes, business foundation classes, and specialized courses in the major. Because most students work in the IT field while completing the degree, many use their work experiences as case studies in classwork. The online degree utilizes asynchronous classes, with students working around their professional and family schedules to complete assignments. Students enjoy access to library services and an array of tutoring services, including video conferencing with academic tutors. The school uses D2L for online classes, and a virtual bookstore ensures students can access the materials needed for success. Students may accelerate their degree completion by transferring previously earned credits from accredited schools and converting their professional experience into college credit. NLU awards credits for industry certifications, licenses, and passing specific standardized tests. Students may also document what they've learned through work and life experience in a portfolio to be evaluated for credit. National Louis University, in Chicago, Illinois, serves more than 7,500 students each year, the vast majority (91%) of whom attend school part-time. National Louis University is regionally accredited by the Higher Learning Commission (HLC). Mid-America Christian University ranks among The 15 Best Online Bachelor's in Management Information Systems Programs! Mid-America Christian University weaves ethics throughout the curriculum of its online bachelor's in management information systems degree. The 122-hour degree plan covers essential topics of information technology, such as programming languages and information architecture. The school identified ethics instruction as a curriculum initiative that would set graduates apart from other job seekers in the field, and Mid-American Christian includes ethics in the degree title. The emerging technology seminar ensures students stay abreast of the latest innovations in this fast-changing field and can hit the ground running when they enter the workforce. Students access class materials anytime during the five- to ten-week terms using the Desire2Learn platform. Students with significant information technology work experience, military training, or prior college attendance benefit from generous transfer policies, which award credit for work completed from accredited schools, vocational experience, or those with earning industry certifications. Online students work closely with academic advisors to design a degree plan. The Charles Ewing Brown Library collection provides distance learners access to more than 156,000 electronic book titles and 32,800 online periodicals. Students also enjoy access to the print book collection. The private liberal arts college in Oklahoma City opened in 1953 in Houston, Texas, under the direction of the First Church of God. The school moved to Oklahoma City in 1986, and now affiliates with the Church of God (Anderson, IN) denomination and Wesleyan teachings. More than 2,800 students attend the school, which offers two-year, four-year, and graduate degrees from eight schools. Students may begin the online management information systems degree in January, February, and March. An online bachelor's degree in management information systems is a common entry point in this dynamic field; even without a master's, you can pursue a wide variety of careers. Problem-solving, effective communication, an interest in technology, and the patience to work long hours developing and debugging programs are skills best suited to careers like the ones outlined below. Database Administrator: Otherwise known as DBAs, database administrators leverage software and their understanding of database languages to store, organize, and secure data, typically for organizations with large databases. Some DBAs specialize in areas such as financial information. Starting their career with a bachelor's in information systems, DBAs can advance to become computer and information systems managers. Information Security Analyst: As cyberattacks increase, information security analysts' responsibilities expand. Their job is to protect an organization's computer networks and sensitive information by monitoring, testing, and implementing security measures. Information security analysts also develop security standards and disaster recovery plans. Employers typically look for candidates with a bachelor's degree and experience in a related occupation, such as a network administrator. Computer Network Architect: This role involves building an organization's internal networks, ranging from small interoffice connections to enterprise-wide cloud infrastructures. Network architects need five to ten years of experience in a related field in addition to their bachelor's degree and may eventually progress to positions in IT management.